Of those surveyed in an AACD survey, 99.7% of adults believe in the social importance of a healthy and beautiful smile. If a person’s teeth are not straight or white, it can often lead to unwanted assumptions regarding their quality of life or personality. For instance, a person’s quality of work may be assumed based on the quality of their smile. A person who takes good care of their teeth, one of the smallest details of the body, can therefore be assumed to take great care of their work. Fortunately, if you have been cursed with an unfortunate flaw in your smile, cosmetic dentistry can help you look your best. Dental veneers, also called porcelain veneers, give your smile a beautiful appearance without the need for serious oral surgery. Custom-made, veneers are thin shells that are bonded to the front of your teeth in order to change the appearance of their length, size, color, or shape. Veneers are particularly great for patients who have chipped or worn teeth at the front of the mouth. During the procedure, the dentist will clean and etch your tooth before applying a special cement paste which will bond the veneer to your tooth. Once the veneer has been properly bonded, the cosmetic dentist will then remove excess cement and make adjustments in order to ensure the genuine appearance of the veneer. In the case of teeth gaps, veneers can be used in order to achieve the appearance of a straight smile. However, teeth bonding is one of the most common treatments. 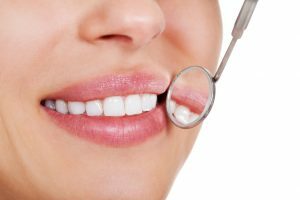 Another procedure of cosmetic dental care, teeth bonding is a simple practice involving the application of a tooth-colored resin to your gapped teeth. Once applied, the dentist will then proceed to mold the resin to a satisfactory appearance. The dentist uses ultraviolet light in order to harden to resin to bond it to your teeth. Once the resin has significantly hardened, the dentist will then polish it so as to reduce the risk of irritation to your lips. In both the case of veneers and teeth bonding, your cosmetic dentist will ask you to return after a series of days in order to ensure that the appearance of your teeth are satisfactory. If you’re disappointed with your smile and think you may benefit from dental veneers or teeth binding, consult your dentist to see if your teeth are healthy enough to undergo cosmetic dentistry. Your smile could be fixed is as little as one office visit!